It's a short post today simply to share a card I made for a couple of my favorite challenges, Retro Rubber Challenge and Sunday Stamps Challenge. The colors and the sketch came together beautifully, don't you think? Both of my stamp sets qualify for the older than a year rule at Retro Rubber. 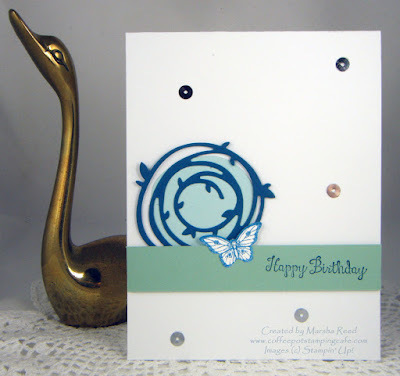 The Bloom with Hope stamp set came out in 2014 as a Host Set. Papillion Potpourri is over a year old, too, but I don't know the year it came out. It's still a current set available in the Annual Catalog. 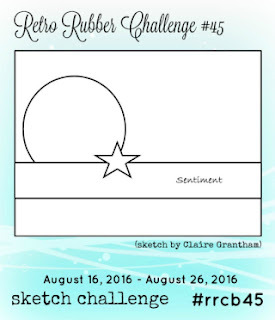 The sketch I used is from the Retro Rubber Challenge. For all the challenge details and to share your project, click the image below. Marsha, lovely card for your challenge combination. 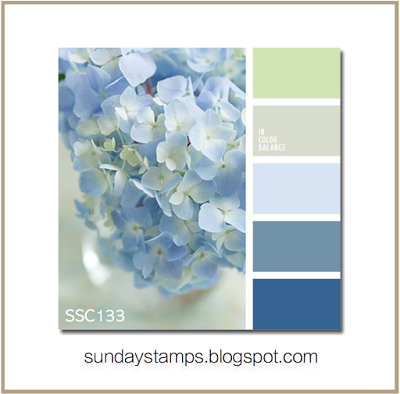 I love those colors at Sunday Stamps... may have to look into that challenge. Anyway, the Papillon Potpourri was introduced in 2012... plenty of age on that stamp set even if it is still available in this year's catalog. Who knows, it may be another "Lovely as a Tree" stamp set. Thanks so much for including Retro Rubber in your stamping fun. Always enjoy seeing you in our gallery. Thank you, Katy! Blues are my favorite colors with which to work since blue is my favorite color. Wow! It took me four years to finally add it to my collection. You can't go wrong with butterflies. Thanks, Claire! The colors are great and went so well with the Retro Rubber sketch. Loved it. Hello Marsha: Love that Swirly Scribbles dies and the sweet butterfly from Papillon Potpourri looks lovely in blue. Beautiful way to combine both challenges, thank you for playing along with us at RETRO RUBBER, hope to see you back in the gallery soon. PS. If you want to find out the age of your SU stamps, go to the Stampin' Up! galleries over at Splitcoaststampers, if you know the name of your stamps, you will find their age there, they are in alphabetical order so it's easy to find what you're looking for. Another good place is Pinterest, also with the name of your stamps, you can go visit the blog of the person who created the card and see the date. Thanks, Maria! Two of my favorites. Thank you for the tip on where to find the ages. I always have to go back through all of my old catalogs. Those two resources will make things a bit easier. Very pretty CAS card! Love your color choices, too! Thank you for playing along with Retro Rubber and hope you will join us again soon. Thanks, Debbie! I like playing along with Retro Rubber as it lets me use stamp sets that I sometimes tend to ignore. Beautiful job with the colors! Love the CAS design! Live the colors and the CAS card. Thanks for sharing with Retro Rubber.